Is there more to it than just learning how to control understeer and oversteer? Every course with CAT Driver Training begins at the CAT Hub, our Millbrook Proving Ground centre within Alpine Loop 3. During our discussion on your unique objectives for the session, we often hear “I would like to improve my car control”. We’ve learnt these words mean something different to us all. Take a minute and think of what that phrase conjures up in your own neural networks:- Ken Blocks crazy gymkhana skills; Lewis Hamilton saving a twitch of oversteer at 150 MPH; perhaps the ultimate WRC high speed power slide on gravel? Or is the picture more real, vivid and personal? An uncomfortable half spin on your last track day or perhaps that impending feeling of doom when you realise you’ve entered a corner too fast on a road you’ve driven hundreds of times? At these moments on reflection, the mental summary of the challenges you experienced are often re-capped by the umbrella term “Car Control”. Should it be, or is this whole driving thing more complex than just a summary? How do we define Car Control? Observing drivers from the passenger seat has given Paul, Steve and myself a unique insight into driving behaviour. If we take the Human Fight and Flight survival mechanism as an example, at its most basic level we are designed to respond to threats to our life in a prescribed way. Our physiological response will serve us well if we need to stand and fight a menacing animal or run as fast as we can to escape. 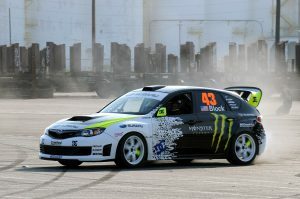 Fight and flight are apparent when for example driving on a racing circuit for the first time, or driving through the first hour on a course at Millbrook. Drivers will instinctively look closer to the bonnet than they are aware they should, or grip the steering wheel tighter than they need. The net result – a poor line through a corner or an unstable braking zone. What the driver senses is poor car control. What we sense from the passenger seat is the emotional state change in the driver, consequently disturbing the dynamic balance of the car and the line we have taken. Once these learning triggers have been identified by the client, we can work together to find coping strategies and learning outcomes to take to the next exercise, corner or lap. Have we evolved over the millennia to transpose our instinctive survival mechanism to car control skills? Probably not. Humans are designed to run, walk and ride a horse, not drive down a German autobahn at 140 MPH. Consequently, what we have learned at CAT and what we pass on to you in every course is the human aspects of car control. The CAT Instructor team have all attended Accredited Coaching courses in Driver Development covering the psychological aspects of driving. It backs up what we have learned and gives us our unique approach to developing your car control skills. Find out more about our instructors’ qualifications here. Why did I do that? I know what to do! If you find yourself in an over grip limit situation, you need to make inputs on the controls correctly and at the right time, to recover the vehicle. Your survival mechanism may intervene and ironically, convince you to react in the instinctive manner we are born with and is inappropriate for the situation. Having coached and trained large numbers of drivers, this I believe is often the reason we have crashes. Even if you know how to react, unless the process of recovery is muscle memorised, you may not react appropriately. What we have learned at CAT is in times of stress, deep concentration, moments of new learning and on occasions apprehension, what we think we are achieving behind the wheel and through the controls may not be the reality. Living in the moment and learning how to reflect accurately on your own performance is one of the key pillars of driving with true precision and accuracy. Car control can only begin to become instinctive and unconsciously competent (Ref 1) if we are acutely aware of our own execution of the driving process. The words are easy to write but their understanding has taken Paul, Steve and myself years to master. CAT prides itself on being unconsciously competent when we coach and instruct. The benefit to you: the most efficient and cost-effective way to learn and develop your car control skills, whatever your objective. When optimising your driving process, a pivotal consideration is to understand how vehicles behave: a fundamental feature of every CAT course, deep routed in our brand DNA. Understanding your performance car’s engineered DNA is key to your driving enjoyment and safety. What have the ride and handling and dynamics engineers designed into its heart to give you the best possible driving and ownership experience? In one marque, for example, you can fine-tune the turn in phase of a corner by understanding the unique steering response characteristic. Another, the relevance of the aero package on high speed stability – some become significantly more stable the faster you go. The CAT dynamic experts coach you to discover this knowledge and understanding or perhaps simply put, we help you improve your car control. Racing drivers also rely on telemetry and information accrued on a data logging device such as VBOX, or one of the many Smart Phone apps to optimise each corner of every lap. Do we need that level of interrogation for a holiday road trip through the Alps? No of course not – especially when we already have an in-built data logger: the human brain! My brain has become very good at sensing, feeling and accruing data. Deciphering the information coming through the seat of your pants, hands, feet, ears and the hidden G sensor which we all have in our human VBox, will all help with? Yes, you guessed it ………….. car control. Take a look through the blogs on our website and you will find lots of information to improve your car control. But let’s finish with the part of the car that’s in the equation but often forgotten – the driver. Are YOU ready for your next driving experience whatever it will be? Coaching and Training is often contextual, presenting information in a format that makes sense and is relevant to the client is key for successful learning. At CAT we truly understand the context and meaning of car control and how you can achieve it. It’s a life quest, an art form and has many components, therefore in summary “Car Control” may just be too simplistic a phrase to do justice to the wonderful art of driving. To drive at the envelope of grip is for me still one of life’s greatest pleasures. 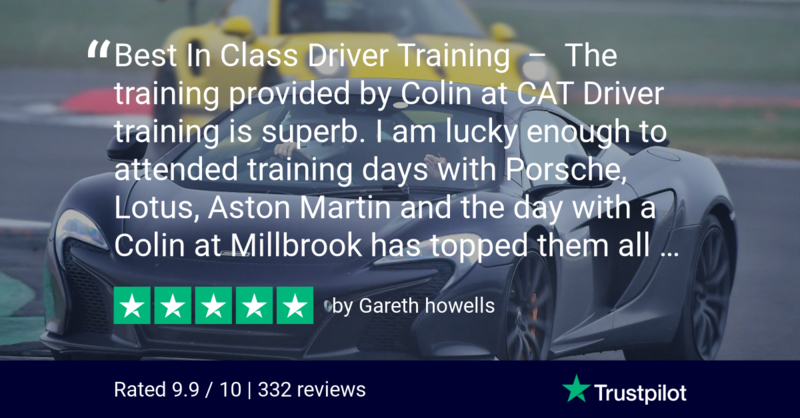 If you would like to experience that pleasure for yourself, please contact our team for a chat on 01234 757 633 or email us at info@catdrivertraining.co.uk. Click here to read Part 2 of The Secrets of Car Control.